It’s no secret that the warm climate in the Hill Country can negatively impact deer nutrition, especially during the summer months. That’s where the new Purina Antlermax Climate Guard comes in. Nobody feels like eating when it’s 100 degrees in the shade. So when hot weather hits your herd, weight gain and body condition can suffer. That’s why AntlerMax® deer feeds are now formulated with our exclusive Climate Guard TM supplement, which supports weight gain and body condition by encouraging feeding during heat stress events. Heat stress and other stress events may pose a nutritional challenge to animals. Patent-pending Climate GuardTM supplement is a blend of plant extracts. New AntlerMax® formulations with Climate GuardTM supplement are formulated to provide antioxidants to support deer during climatic stress, like hot weather. Climate GuardTM supplement is comprised of high-quality ingredients that support rumen function, gut health and optimal nutrient utilization. 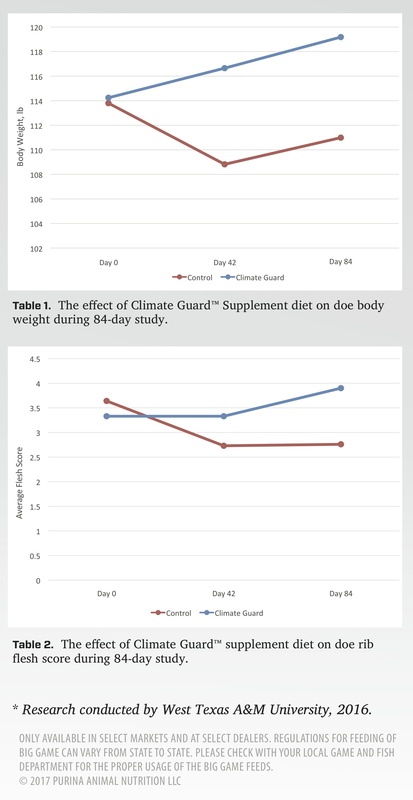 Climate GuardTM supplement supports digestibility of starch in the small intestine. After 42 and 84 days of treatment, does consuming AntlerMax® Breeder pellets enhanced with Climate GuardTM were 10% and 8% heavier than the does consuming the Control diet (Table 1). The researchers observed that the does consuming the AntlerMax® Breeder pellets enhanced with Climate GuardTM frequented the feeders more often during the heat of the day than does consuming the Control diet which supported the increased weight gain and Rib Flesh Scores. This new Climate Guard Supplement is available for Antlermax Deer 20 Climate Guard, Antlermax Breeder Professional 16 Climate Guard, Antlermax Mule Deer 22 Climate Guard and Antlermax Breeder Textured 17-6 Climate Guard. Stop by Lochte Feed and General Store in Fredericksburg, TX for new Antlermax with Climate Guard. Ensure your herd receives optimal consumption year round even during the hot summer months. This entry was posted on Wednesday, March 15th, 2017 at 8:47 pm	and is filed under News & Updates. You can follow any responses to this entry through the RSS 2.0 feed. Both comments and pings are currently closed.